Happy Tuesday, my friends! We are back with another installment of Tuesday Tidbits, where I try to track down events that I think would be of interest to you, my fellow Geeks here in Indiana! 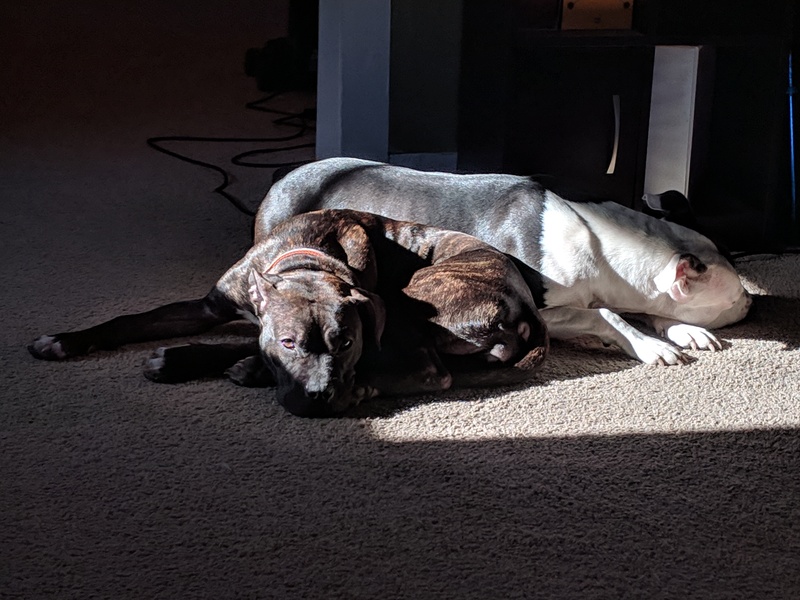 Plus, hey, cute animal pictures! I hope everybody is doing well! It’s been a busy week here at the Geek Cave, as Friday we recorded yet another episode of the new You’re Gonna Love It… or Not… podcast, Saturday was a friend’s birthday, and Sunday I went and got together with the old Star Trek Discourse crew to start talking Season Two of Star Trek Discovery. Then, on Monday, we finally took down the Christmas decorations. I’d apologize, but dang it, half of the ornaments need to have batteries taken out of them before going in a box for ten months, and that’s slow, tedious work! So, I’m not sorry that we took longer than usual on this! This week is going to be another full week of audio editing, and hoping I can get a podcast title out of Lizz, so we can start getting the third podcast set up. In addition, I need to do some editing to old shop reviews, clean up of old posts, and start working on my plans for a blog overhaul, while still getting some new posts out for everyone, including a movie review for one of my Patrons. Are you a Patron? Would you like to help the blog, and help me pay for a table again at PopCon Indy? Take a look at the bottom of the post! Now, let’s move on to what’s happening for Hoosier Geeks! We are now in 2019! Let’s look at this month! January 25th: Five Year Mission @ The Melody Inn! Our very own Star Trek-themed rock band will be playing at the Melody Inn in Indianapolis this Friday night, along with The Leisure Kings, Palace, and another band to be announced! Remember: The Melody Inn is a 21+ venue, and is cash only! Heck, let’s look at February, while we’re at it! February 2nd: Star Trek Opening Day Celebration at the Children’s Museum! As I’ve previously posted on the blog (Link 1, Link 2), The Children’s Museum of Indianapolis will be host for a lot of really great Star Trek exhibits and shows starting in February, and this is the kick-off! Featuring shows by Five Year Mission, and other special activities, this will be a great way to visit this limited-engagement exhibit! February 6th – 10th: Winter Fantasy! Someday, I’m going to make it up to this, but sadly this is the weekend of the Geekling’s Birthday! For those who aren’t familiar, it’s a gaming con up in Fort Wayne! Take a look! February 8th – 10th: Anime Crossroads! This fan-run anime show at the Wyndham West in Indianapolis has bee a long-running tradition for many of my readers! February 17th: Ash Comic & Toy Show! The longest-running toy and comic show in Indianapolis is returning to the Rodeway Inn in Indianapolis! February 23rd: NWI Comic-Con! Held up in Schererville, this con has been happening for a few years, and I have heard a lot of good things. Maybe this year, we can take the Cardis up north and check it out! As if there isn’t enough going on, let’s look at March! March 6th: Michael Moreci @ Comic Carnival! Michael Moreci (Star Wars Adventures, Wasted Space) will be at Comic Carnival in Indianapolis from 11 AM to 6 PM, signing his books. This event was initially scheduled for the end of January, but was rescheduled by publisher request. March 22nd – 24th: EvilleCon! This fan-run anime convention is returning to the Holiday Inn at the Evansville airport for another year! Check out their website for information about the con, including their guests! March 22nd – 24th: Who’s Yer Con! This fantastic, locally-ran gaming convention is back for another year! General admission is free, though if you have the means, I strongly encourage going to the site, pre-registering, and ponying up the cash for the paid admission. Not only are you supporting a fun local con that tries to open up the hobby of gaming to everyone, you’re also able to get a bag filled with games, and a t-shirt, while supplies last! March 24th: Ft. Wayne Hobby & Record Show! This one day hobby show up in Fort Wayne looks to be a good place to go hunting for collectibles, to fill those holes in your collections! Take a look at their Facebook page for more information! Now, what’s happening with the blog, the blogger, and friends of the blog? 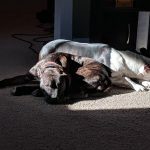 Today’s Picture: The Geek Pup and the Geek Dog relax in a sunbeam on a cold day. Hoosier-based Crowdfunding: Here’s where we take a look at crowdfunding campaigns by Hoosier creators! Fancy Swears – This was brought to my attention by the Nerds Your’re Looking For podcast on FB. It’s just what the name says! Fancy swear words, in pin form! New swears will unlock, the more it earns! So, take a look before it ends on February 10th! Team Geeking Family of Podcasts: In case you missed the post on Friday, I have friends who are starting to do podcasts, and I’m helping out with them. With these podcasts, we have started the Team Geeking Family of Podcasts, which sounds only slightly less pretentious than the Team Geeking Podcast Network. I encourage everyone to take a look at the page, to see what the 2019 plans are! Star Trek Discourse: With CBS All Access releasing season two of Star Trek Discovery, it’s time for a bunch of Geeks to get on camera and talk about it, because that’s what we do. Join the Facebook Group linked above, to see all of last season, and see the new episodes when they’re released! Where to find Indiana Geeking: I am fairly certain you know where to find me on social media, but there’s a couple other websites I use fairly regularly, where you might want to keep an eye on me! Letterboxd – I know I’ve mentioned this on more than one occasion, but just in case you weren’t aware, here it is! Letterboxd is where I keep track of all the movies I watch, be it on television, Netflix, or at the theater. I have a goal for this year on there, and it’s just a fun site for those who enjoy movies! Goodreads – Update on my reading progress: I’m reading a LOT of graphic novels on my Kindle, and those get added to my list. Feed a Blogger! Are you looking to support the blog? Podcast hosting fees are coming soo, and this link gets to to every place that you can help, like buying through Amazon, buying Geeking merch, or even donating! Ko-Fi (Immediate) – This enables you to “buy me a coffee” and the money immediately goes to PayPal. This can help with immediate bills! Patreon (Long-Term) – This helps long-term, month-to-month. I can not stress this enough, my friends! If people just gave a dollar a month, each, that goes so bloody far for a creator like myself! So please, if you can, throw in here! Amazon Affiliate (Long Term) – If you’re shopping through Amazon, then please, feel free to use the Affiliate link! The money isn’t immediate, because I have to hit a “cash out” amount, and then it takes a month or two for the money to become available, to make sure they aren’t paying out and then someone returns a high-end item, but it helps boost the bank account! Do you like how the blog looks? Then check out Studio 27 Indy and TikiKitchen Design. I just write this stuff. They’re the ones that make me look good. Also, check out the art page on TikiKitchen Design! There’s some great stuff on there! It’s TikiBitchin! Am I missing anything? Use one of those contact links to give me a shout! Have a great week, and I’ll see you later!